One of my all time favorite colors is navy. I've always loved to wear it, and I love that it is becoming a home decor trend again. If we were to dig through some of my old photos, you would even see that my homecoming gown was navy. But we won't do that. Remember that perfume from the 1980's that said, you always feel beautiful in navy ? It's dramatic and still friendly. It makes everything somehow warmer, even though it is a cool tone. I got this secretary from a dear friend of mine. I remember when they first had it and I always admired it. When she asked me if I wanted it, I couldn't say no! 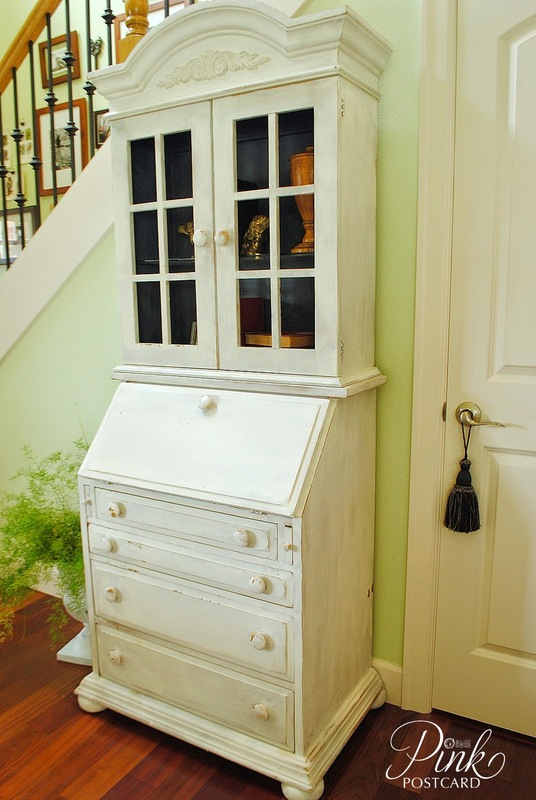 It was beautiful in it's original pine, but I saw so much new potential in a fresh color. 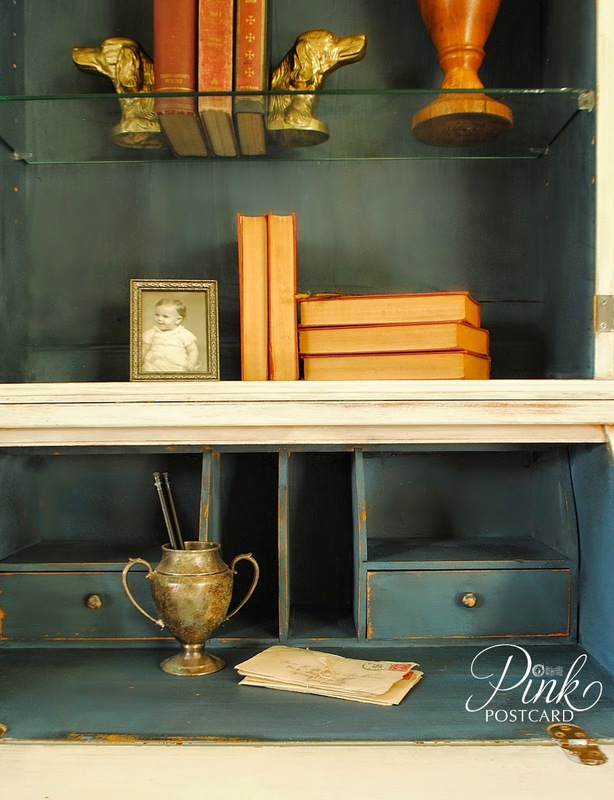 And I have been dying to try Artissimo on some furniture projects. It's such a pretty, inky blue. 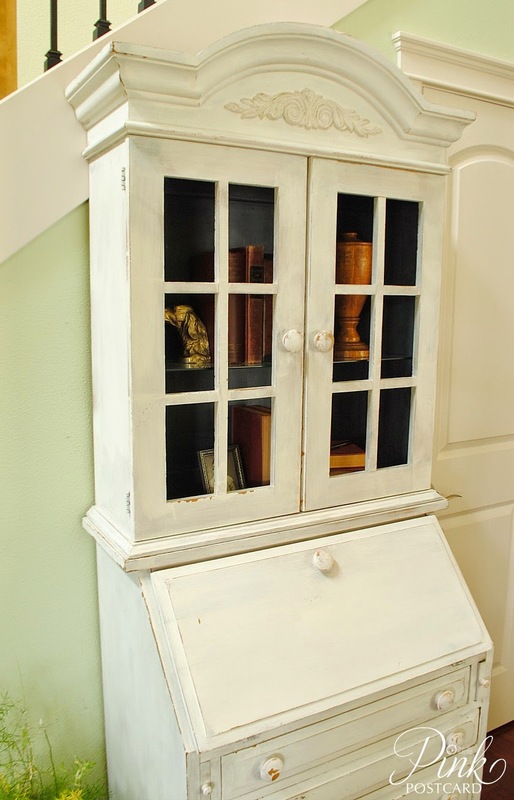 I thought it was a great complimentary color to Linen for the interior of this piece. 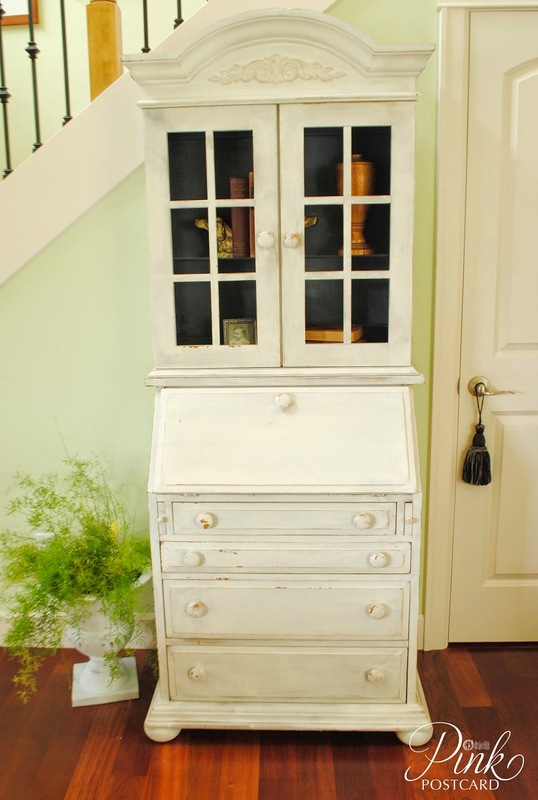 I'm still having so much fun working with milk paint. I love the nuances of it and the results with each project. 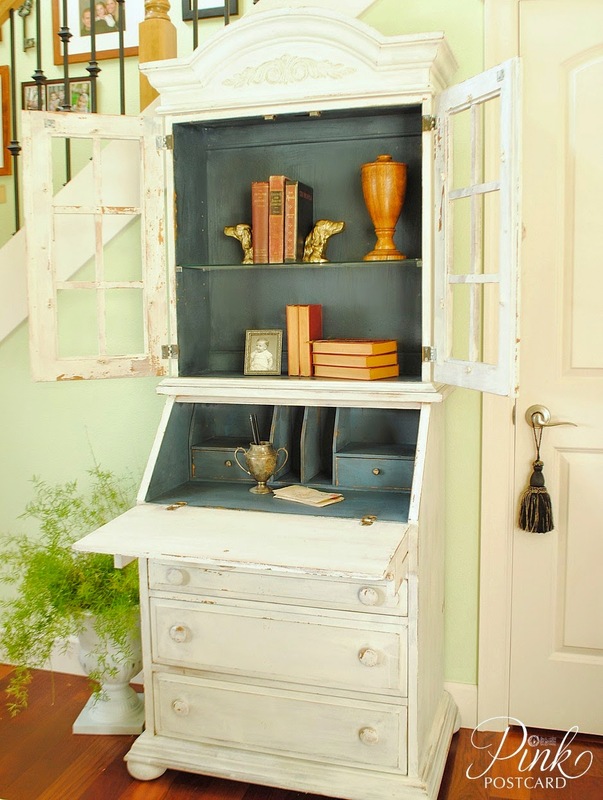 It's such a great piece, and offers so much storage and decorating options! I just dropped it off at Aunt Bee's this weekend. With the end of September quickly approaching, I've started making my to do list of everything that needs to get done before The Farmhouse Show in 4 weeks! Lots to do between now and then. I'm already working on Christmas projects....whew. How about you? Are you a fan of navy? Oh wow, I love it! Your right, that blue color is mesmerizing! Your a lucky girl to have such a sweet and thoughtful friend. great color combo! Love it! What a treasure. Love your colours. I've always loved navy...even when it wasn't in "style." Your secretary is gorgeous...love the color combination you used. Love it and the coordinating inside color!...great work with your display too! That is just a gorgeous piece. I LOVE it!!!! I am not a fan of navy but I think you may convert me! 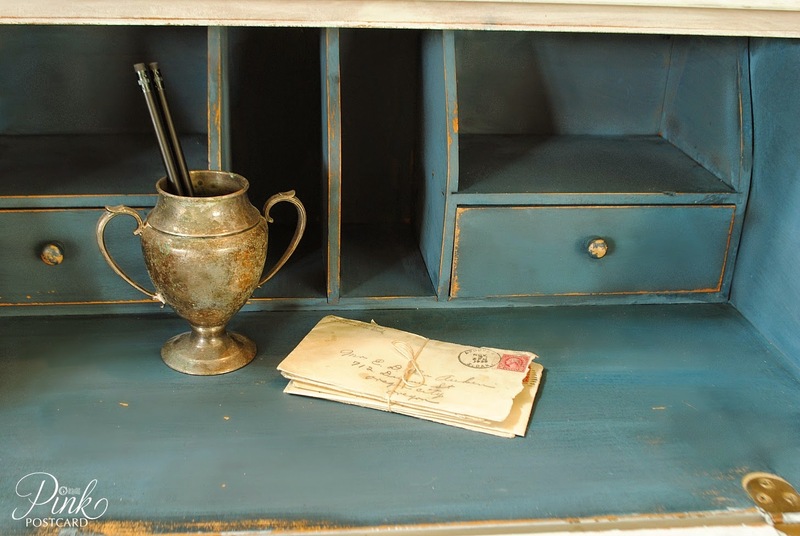 I ordered some milk paint--after seeing the cabinet you did (with the shutter look) I just have to try it. Love your work!